ด้วยโครงการดังกล่าว ประกอบกับความมุ่งมั่นของเราในการพัฒนานักพัฒนาซอฟต์แวร์และนักการตลาดดิจิทัล เราหวังเป็นอย่างยิ่งว่าจะได้มีส่วนร่วมในการช่วยเตรียมความพร้อมสำหรับ "ประเทศไทย 4.0"
Ben King, Country Manager, Google Thailand is seen on stage with Prime Minister Prayuth Chan-ocha, Deputy Prime Minister Somkid Jatusripitak, Deputy Prime Minister Air Chief Marshal Prajin Juntong, Dr. Pichet Durongkaveroj, Minister of Digital Economy and Society, and Dr. Nuttapon Nimmanphatcharin, director of Digital Economy Promotion Agency (DEPA) at the opening ceremony of Digital Thailand Big Bang 2017. All over Thailand, we see people and businesses embracing the Internet to do amazing things. Whether it’s a small business using the internet to find new customers and grow, a developer who’s created an app to help people manage their finances, or a blind teacher who’s using YouTube to teach kids to sing, the web has enabled Thai people to find new opportunities and new audiences in ways that weren’t possible that long ago. At Google, our mission is to organize the world's information and make it universally accessible and useful. This is why we’re excited by the government’s goal to bring affordable, high-speed internet access to villages across Thailand under the Netpracharat program. Along with access, the long-term success of a country's digital transformation lies in its people's digital knowledge, so that they can make the most of the information and opportunity that the internet offers. For this reason, we’re pleased to be embarking on an initiative that will enable 3,000 Digital Community Managers under the Netpracharat program to take a leadership role in fostering digital skills in the wider community. In partnership with the Ministry of Digital Economy and Society, we hope to equip these digital ambassadors with the knowledge and resources to enable them to deliver trainings on the use of different digital tools, responsible behavior and safety across various platforms. Over the next two years, these Community Managers will then go on to train many more people in the 24,700 villages that will receive high-speed internet connection through Netpracharat. 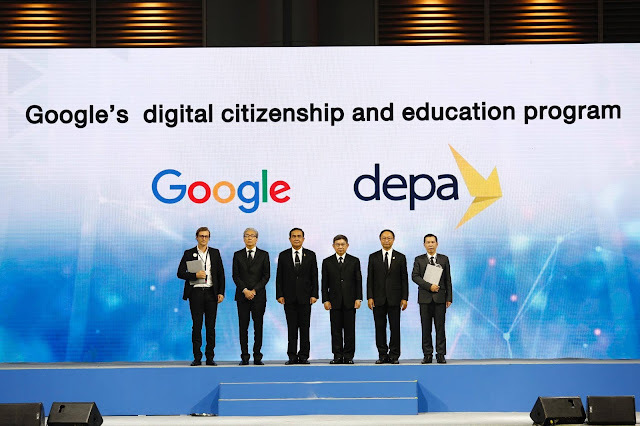 Through this program, along with our commitment to training developers and digital marketers, we look forward to continuing to play a small part in helping prepare the nation for “Thailand 4.0”. Saat ini, orang dan bisnis Di seluruh Thailand, internet digunakan untuk melakukan banyak hal luar biasa, baik bisnis kecil.